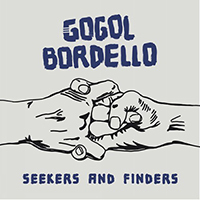 Album Gogol Bordello - Seekers and Finders takes us in the midst of fun, already the starting song Did It All dances in a hot rush, having fun and show surprise from a lot of entertainments around. Combining symphonism with meditative sadness Walking on the Burning Coal changes musical style, enveloping in prelery motifs, but now in a minor mood. Again, the frenzy of revelry returns in Break into Your Higher Self song, but already somewhat burdensome and generating anxiety and tension. In the middle, a pensive vocal confession sounds, but once again we are kidding and having fun. The title track Seekers and Finders sounds like just so grand and charming ballad in which female and male vocals are combined with soft and soft music into a bright musical image. Oh, this kind of music draws you to listen again and again, more and more. Remembering the past, Familia Bonfireball turns to reflections on opportunities and accomplishments, demanding to be more attentive and restrained. Reflections of the vocal are caught by the charming leitmotif, creating a romantic atmosphere. The thoughtful and muffled ballad Clearvoyance brings to music the share of blues mixed with gypsy motifs. Despite the name Saboteur Blues, this style does not dominate in this song - rigid, harsh and powerful rhythmic structures and demanding, confident vocal phrases shade the lady's short exclamations. Funny reflections are combined with dancing in narcissistic music, because male and female vocals belongs to Love Gangsters. Love, charm and seduction are their daily activities, there's no doubts! If I Ever Get Home Before Dark words starts the song, the story of a weary bard about the old roads, pathways, passages and passed tests. Then a crowd of vagabonds join the story, emerging from the darkness around the campfire for a few words. Restrained fun and unobtrusive joy You Know Who We Are (Uprooted Funk) envelops with the atmosphere of hope, complemented by symphonic keyboards passages. The bard already rested from the mess and regained strength - completing the album Still That Way calls for further accomplishments, in no case to retreat and surrender to any difficulties and obstacles.